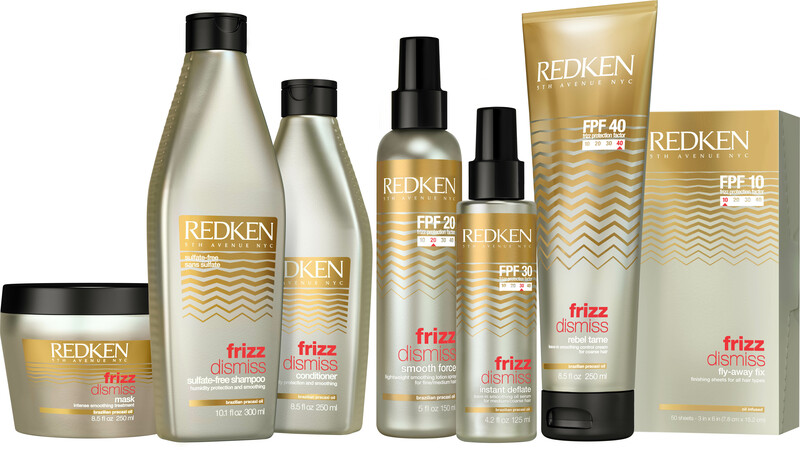 Home » Tips & Tricks » Hair Care » NEW from Redken: Frizz Dismiss beats humidity like never before! As the temps rise, so does that dreaded blowout killer- HUMIDITY! Many of us have left the house looking impeccable and arrived at our destination looking, well, frizzy and it only gets worse as the day goes on! How many of us avoid sitting al fresco at a restaurant and opt to stay indoors to avoid frizz? Guilty! According to an article published by the New York Times, 6 out of 10 women say that frizz is their #1 most dreaded hair issue and another article via the Wall St. Journal sites 85% of women regularly battle frizz. But this summer will be different because relief is here. Redken, a leader in innovative haircare, has done it's research on the frizz topic in the epicenter of humidity- the Amazon rainforest in Brazil. The results are nothing short of game changing when it comes to taming frizz for every hair type. Hair Cuttery is excited to offer this new line in our salons, introducing FRIZZ DISMISS! Redken developed the first ever Frizz Protection Factor (FPF) with four levels of smoothing and humidity protection. They've covered all frizzy hair types from fine to coarse and unruly. Sulfate-Free Shampoo gently cleanses and shields hair from frizz for a smooth controlled finish. Conditioner deeply nourishes to protect hair from humidity and provide a smooth, manageable, shiny finish. Mask dramatically conditions and shields hair from humidity for lasting smoothness. FPF 10 Fly-Away Fix are finishing sheets that wipe away static and smooth frizz. Perfect to toss in your bag and go! FPF 20 Smooth Force is a lightweight smoothing lotion spray that provides intense humidity resistance and adds shine. FPF 30 Instant Deflate is a leave-in smoothing oil serum that protects from heat and humidity with dismissing unwanted volume and adds glossy shine. FPF 40 Rebel Tame is a leave-in smoothing control cream that provides intense discipline to knock down frizz with lasting control. Smooth Force, Instant Deflate and Rebel Tame all provide styling heat protection up to 446 degrees! Just walk in to your local Hair Cuttery to stock up on Frizz Dismiss or any other of your favorite Redken products and take advantage of our Buy One, Get One 50% off sale! Plus, get a FREE zebra clutch with any $20 purchase of Redken products as our gift to you! But hurry, the clutch is only available while supplies last and our Redken BOGO offer ends on 5/25! If you're still not sure which products work best for you, be sure to ask your HC stylist for their advice. Have a great spring from Hair Cuttery!